SBI Clerk Notification 2018 – Official Online Notification released for SBI Clerk 2018 examination for 8310 posts Junior Associate in Customer Support & Sales. SBI Clerk Notification 2018 – State bank of India has released Officially Online 8301 Clerk Post Vacancies with include both regular Clerical cadre vacancies and backlog vacancies for the post of SBI Clerical Cadre (CS & Sales Juinor Associates). The Candidates can appear for the SBI Clerk Junior Associate test only once under this recruitment project. The SBI Clerk Candidates can apply for vacancies in one State of india only. 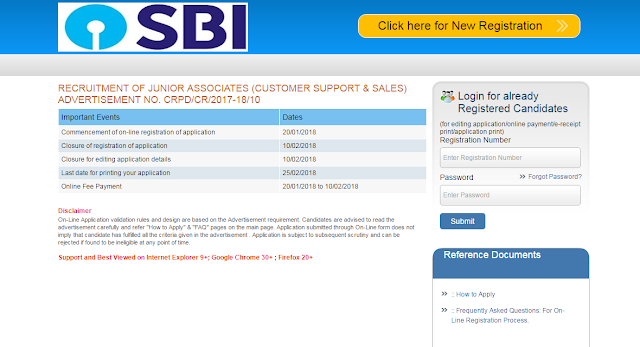 everybody is surprise Finally SBI has released vacancies for Junior Associate in Customer support and Sales this years, it is a great opportunity for those candidates preparing for Banking examinations.